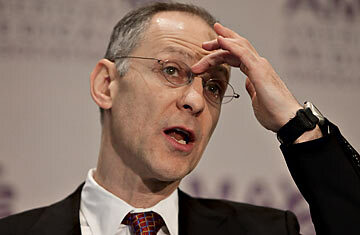 Dr. Ezekiel Emanuel, the medical ethicist and oncologist who advises President Obama, does not own a television, and if you catch him in a typically energized moment, when his mind speeds even faster than his mouth, he is likely to blurt out something like, "I hate the Internet." So it took him several days in late July to discover he had been singled out by opponents of health-care reform as a "deadly doctor," who, according to an opinion column in the New York Post, wanted to limit medical care for "a grandmother with Parkinson's or a child with cerebral palsy." "I couldn't believe this was happening to me," says Emanuel, who in addition to spending his career opposing euthanasia and working to increase the quality of care for dying patients is the brother of White House chief of staff Rahm Emanuel. "It is incredible how much one's reputation can be besmirched and taken out of context." It would only get worse. Within days, the Post article, with selective and misleading quotes from Emanuel's 200 or so published academic papers, went viral. Minnesota Representative Michelle Bachmann, a fierce opponent of Obama's reform plans, read large portions of it on the House floor. "Watch out if you are disabled!" she warned. Days later, in an online posting, former Alaska Governor Sarah Palin attacked Emanuel's "Orwellian thinking," which she suggested would lead to a "downright evil" system that would employ a "death panel" to decide who gets lifesaving health care. By Aug. 10, hysteria had begun to take over in places. Mike Sola, whose son has cerebral palsy, turned up at a Michigan town-hall meeting to shout out concerns about what he regarded as Obama and Emanuel's plans to deny treatment to their family. Later, in an interview on Fox News, Sola held up the Post article. "Every American needs to read this," he declared. By this point, Emanuel, who has a sister who suffers from cerebral palsy, had arrived in northern Italy, where he planned to spend a week on vacation, hiking in the Dolomites. Instead, he found himself calling the White House, offering to book a plane home to defend his name. "As an academic, what do you have? You have the quality of your work and the integrity with which you do it," he said by phone from the Italian Alps. "If it requires canceling a week's long vacation, what's the big deal?" The attacks on Emanuel are a reminder that there is a narrow slice of Americans who not only don't trust government, but also have come to regard it as a dark conspirator in their lives. This peculiar brand of distrust helps create the conditions for fast-moving fear-mongering, especially on complex and emotionally charged topics like the life and death of the elderly and infirm. Prairie fires of that kind are hard to douse when the Administration's own plan for health care remains vague, weeks away from being ready for a public rollout. The health-care bill that recently passed the House does not contain, as some have suggested, any provisions that would deny treatment to the elderly, infirm or disabled like Sola's son. One provision allows doctors to be reimbursed for voluntary discussions of so-called living wills with patients, but does not in any way threaten to deny treatment to dying patients against their will. The legislation anticipates saving hundreds of billions of dollars by reforming the health-care system itself, a process that would try to increase the efficiency of medical care by better connecting payments to health outcomes and discouraging doctors from unnecessary tests and procedures. The Obama Administration hopes that many of these reforms will be made in the coming years by independent panels of scientists, who will be appointed by the President and overseen by Congress. For Emanuel, the entire experience has been a painful education in the sometimes brutal ways of politics, something his brother has long endured and doled out. "I guess I have a better appreciation for what Rahm had to go through for years and years," Emanuel says. But that appreciation does not solve the question raised by the controversy. There is universal understanding that the nation's fiscal course is doomed without major changes to health care, but whom will the American people trust to carry it out? Read "The Five Biggest Hurdles to Health-Care Reform."